I'm Voting for Health Care! On Nov. 6, we all have big decisions to make about who will represent us in elected office. These decisions will affect where, when and we access health care. The impact of our votes this fall will be felt for a generation. We simply can’t sit this one out. The choices in front of us are stark. We can elect candidates who will fight to make sure all of us can see a doctor when we’re sick, or we can choose candidates who want to roll back the coverage we already have. A key part of the Affordable Care Act is protections for people with pre-existing conditions. Prior to the Affordable Care Act, if you had an illness — such as diabetes, asthma or cancer — insurance companies could deny you coverage, forcing you to pay out of pocket for all your care. It was an awful system — the people who needed health insurance the most were left to fend for themselves. 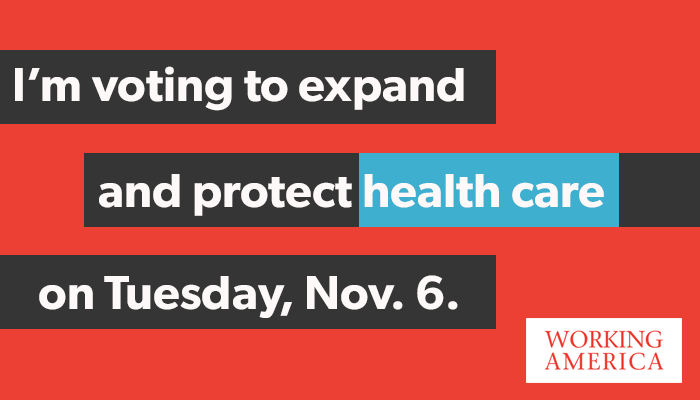 Take the Pledge and tell us you'll vote for candidates who will protect health care this fall.